York U13s hosted East Riding in the semi-final of the West Yorkshire Cup, with York beaten semi-finalists in the same competition last season and coming off the back of a great team performance last week against Leeds, York were determined to transform their recent performances into results. With East Riding kicking off proceedings Yorks midfield of Elliot Oliver, Harvey Stephenson and wingers Conor Teale and Liam White battled hard from the start closing down East Riding and pressuring the ball. 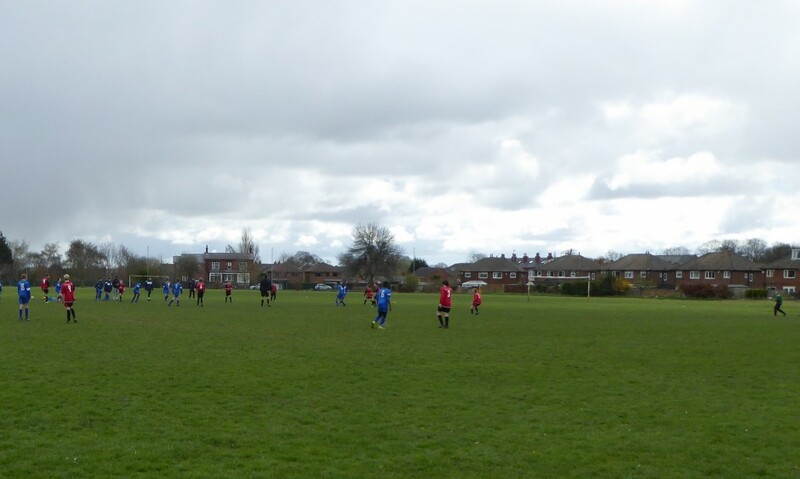 East Riding were also battling hard but neither team could find a way through. Yorks 4-man defence of Leo Jones, Sid McCoy, Alfie Evans and Jacob Caringella were solid and defending vigorously with keeper Joseph Hodge alert and bravely collecting any loose balls, that found their way through, from the feet of the East Riding forwards. It took until the 10th minute for the first shot on target as Ben Calams effort was easily saved by the big East Riding shot stopper. With York now edging the play and creating chances Liam White drove down the left wing skipping past the East Riding defence; but saw his effort saved by the Ridings shot stopper. Minutes later Luke Jones’ shot was again well saved by the East Riding keeper and although York were finding a way through the defence could not breach the East Riding goal. With East Riding pressing to get into the game and keeping a high line, Luke Jones hit a 40-yard speculative shot, noticing the keeper was well off his line, and was unlucky to see it sail inches wide of the left upright. Quick thinking by Connor Teale in the 26th minute, playing a short corner to Elliot Oliver who floated in a perfect cross into the East Riding penalty area, which skimmed off the head of the leaping Alfie Evans for Luke Jones to chest down and smash in a volley, on the turn, at the far post from 6 yards to put York 1-0 up in the tie and making their pressure count. With East Riding breaking down the left it was a last ditch tackle by Leo Jones that saw the first corner of the game go to East Riding. 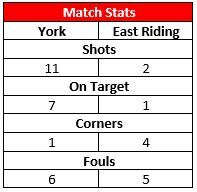 With East Riding having height in abundance in their team employing what looked to be a training ground formation, this looked to be the danger area for York, but credit to York with 10 men back to defend, the corner was well dealt with, with each player working hard for each other. A free kick taken by Connor Teale saw Harvey Stephenson through on goal but unfortunately his shot didn’t test the keeper leaving the half time score 1-0. The second half started at the same frenetic pace as the first but this time it was East Riding on the front foot, pushing for an equaliser. With East Riding pushing forward York were having some joy down the wings with Liam White again dancing through the East Riding defence to put him one on one with the keeper; but his resulting shot was saved by the diving Ridings keeper. 10 minutes into the second half East Riding made a substitution that paid off, as they threw on another striker and within minutes he drove down the left flank hitting a sweet shot from 20 yards, leaving York keeper Nathan Storr no chance, as it flew into the top right hand corner of the goal putting the teams level at 1-1.
Credit to both teams as the pace of the game never let up with all players battling hard for a game they wanted to win in normal time, Luke Jones shot was comfortable saved before York were defending two quick corners in succession, again East Riding using the training ground formation and again York keeping their concentration and finally clearing the danger. With Ben Rhodes working tirelessly up front chasing down the East Riding defence, flicking a pass onto Luke Jones from Connor Teale, who drove down the right wing cutting into the box through the East Riding defence stealing half a yard to hit a left foot shot which flew under the diving Ridings keeper hitting the inside of the left hand side netting to put York 2-1 up with 7 minutes left on the clock. It was all hands to the pumps for York as East Riding threw everything forward. Left back Olly Hanley was kept busy breaking up the East Riding attacks down the right with Alfie Evans continuing his battle with the big East Riding centre forward. With Elliot Oliver and Harvey Stephenson working hard in midfield, the latter had to be substituted as he limped off and moments later Sid McCoy had to be substituted coming worse off in a tackle as the York back four defended resolutely ensuring they closed down the East Riding attacks. With minutes left on the clock East Riding threw everybody forward including their keeper for a corner, again York kept their concentration as the corner was delivered, Alfie Evans getting a header, Jacob Caringella with a block, Ben Rhodes, Leo Jones, Olly Hanley and Liam White with partial clearances as York desperately tried to clear the danger which was eventually cleared by a long punt up field from Luke Jones. Moments later the referee blew the final whistle to the elation of the York players and crowd and they now face Spen Valley in the Final. Managers Comments (Alan Oliver / Neil Stephenson): Outstanding performance by every player in the team. You played with passion and great desire against a very strong East Riding team. Overall, you were deserved winners. Well done, keep it going. I’m very proud of the great football you played. Man of the Match was awarded to: Every player, you made it impossible to choose! Squad: Hodge, Storr, Rhodes, Leo Jones, Hanley, Evans, White, Stephenson, Oliver, Teale, Luke Jones, Calam, Caringella, McCoy (C).